"Awwwwe yeah... it's my day to shine!" Happy Rainbow Dash day everypony! Dash is getting more exhausted being a Wonderbolt, what better way to take a break then to take a nap or two on a soft, fluffly, cloud after the end of a hard day's work? If some of you are not familiar with my work... please feel free to check my profile. : Three cheers for the newest Wonderbolt! For the love of god, please grow up instead of posting such nonsense. How am I floating and why are you looking at me like that ? Rainbow Dash: nah, don't mind me. just chilling up here. what? today was exhausting! can't a Wonderbolt chick get some rest? 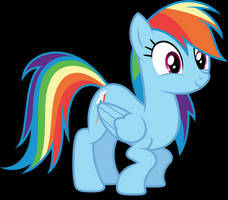 Hey,Rainbow Dash, would you like to be buddies? Nice crisp lines, lighting feels natural, and the posture and expression looks real/personal. My OC Plasma Blaze sees this and says "I hope you're enjoying your time in the Wonderbolts, Rainbow." Dashie sure is. She A LOT more accepted and she truly does have a title! And a bit of fun info... Plasma actually knew Spitfire in flight school. Yes indeed. And they got along well. She has finally become a Wonderbolt. She deserves a good rest after all the training. Because it was her dream. Most popular Wonderbolt in Equestria! Keep on flying high, Rainbow Dash! She sure will! Clearing those clouds in 10 seconds flat! We love you, Rainbow Dash! Amen 2 that, brother! Dashie is best pony 4 life! Looking awesome as always, Dashie. Her dream finally came true, and she deserves rest for her hard work. Yes indeed! Thanks so much. Aww, yes!!! Dashie looks just sooo adorable in her Wonderbolt outfit!! <3 She looks so relaxing here. ^u^ I love the backgrount too, it's beautiful!! It's late, but still, Happy Dashie Day! Take a load off, Dash. You deserve it after a long day of Wonderbolts practice. Love this picture and I shared it on my facebook My Little Pony Savage World page and it is #1 pony after all. Yeah her origin story is very interesting. Also the colors are very vibrant.